Last week I thought that it would be a good time to look at farm sector financial conditions, particularly some ratios of repayment capacity. My timing could have been a little better because only a couple days after I wrote the post, USDA made an update to its farm sector income forecast. Usually you can count on these updates to be relatively minor. Not this time. David will look in detail at the changes to the forecast in a coming post, but with regard to my recent post on financial conditions, a couple of the numbers changed in meaningful ways. The big changes were made to the 2015 and 2016 forecasts. For example, the revised 2015 forecast increased net farm income by $24 billion. That is a big revision! To put it in perspective, the revision is roughly the same size as the 2015 GROSS cash commodity receipts (crops and livestock) estimated for the entire state of Nebraska. When you start making changes of that magnitude it will definitely have an impact on how one interprets the data. Click here for USDA’s discussion of why and how the forecast changed. In general, I think it is safe to characterize the revisions to the forecast as showing a slightly more positive situation with regard to the farm economy than the previous forecast. Below are all of the charts that I prepared last week. I have shown both the pre-August update and the current forecast so you can see how the data changed. Figure 1. 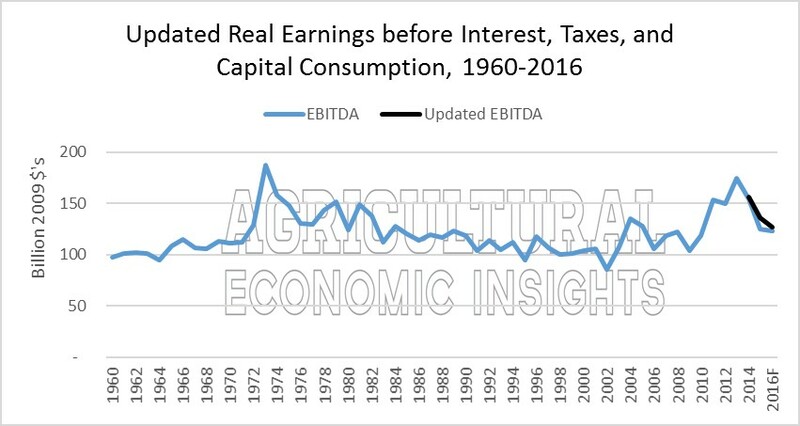 UPDATED: Real (2009 USD) Earnings before Interest, Taxes, and Capital Consumption, U.S. Farm Sector 1960-2016. Figure 3. UPDATED: Times Interest Earned Ratio, U.S. Farm Sector 1960-2016. Figure 4. 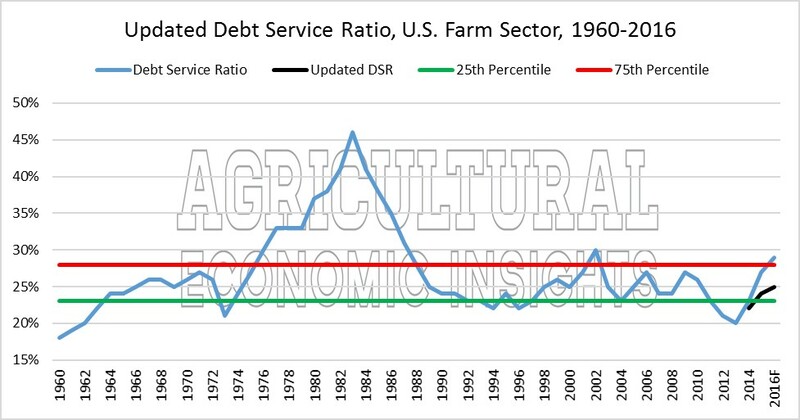 UPDATED: Debt Service (Principal and Interest Payments relative to Value of Production), U.S. Farm Sector, 1960-2016. So What to Make of the Changes? As one examines how the revised data impact our assessment of the conditions there are a number of things to think about. First, although USDA made changes to a number of previous years, the revisions for 2015 and 2016 are the largest. This is not unexpected as both 2015 and 2016 are forecasts. As with most forecasts one should expect changes. Second, the revised updates paint a more slightly more favorable picture of a generally unfavorable situation. The estimates of earnings before interest, taxes and capital consumption didn’t change as much as most of the other measures. This is because USDA made a rather large downward revision of capital consumption. This is a non-cash expense so it didn’t have a large impact on the estimates of sector cash flows as it did on estimates of net farm income. With regard to the debt to asset ratio, the impact of the changes were small. The new update shows the debt to asset ratio still increasing, but at a less rapid rate. The ratio still looks historically low, but as I pointed out last week I don’t think you should pay a great deal of attention to this ratio anyway. Perhaps the biggest impact of the revised forecasts can be seen in the two measures of repayment capacity. The update took the estimate of the times interest earned and debt service ratios out of the most unfavorable quartile of the data. In the case of the times interest earned ratio, this is because the times interest earned ratio measures interest expense relative to net farm income. The large downward revision in capital consumption improved the estimate of net farm income enough that the times interest earned ratio looks slightly better. (There were more changes than just this but it appears to be a big driver). The debt service ratio also improved. This is because the debt service ratio measures interest and principal payments relative to the value of farm production. Here, the improvement appears to have been due to increases to the estimate of the value of production. This is partially due to increasing estimates of cash receipts and smaller negative inventory adjustments. I won’t go into too much further detail because David will be looking at it in another post. The bottom line is that repayment capacity at the sector level is slightly better than the previous forecast. However, it is important to note that the trend towards falling repayment capacity continues in spite of these (rather large) revisions. In short, conditions are maybe a little better than thought, but they are heading in the same direction as we expected when we looked at the previous forecast.